Stacey Kimmons and Audra Lewicki harvest lettuce at the Chicago Botanic Garden's 20,000-square-foot vegetable garden atop McCormick Place West in Chicago. Uncommon Ground, a certified green restaurant in Chicago, hosts an organic farm on its rooftop. The green-roof movement has slowly been gaining momentum in recent years, and some cities have made them central to their sustainability plans. The city of Chicago, for instance, boasts that 359 roofs are now partially or fully covered with vegetation, which provides all kinds of environmental benefits — from reducing the buildings' energy costs to cleaning the air to mitigating the urban heat island effect. 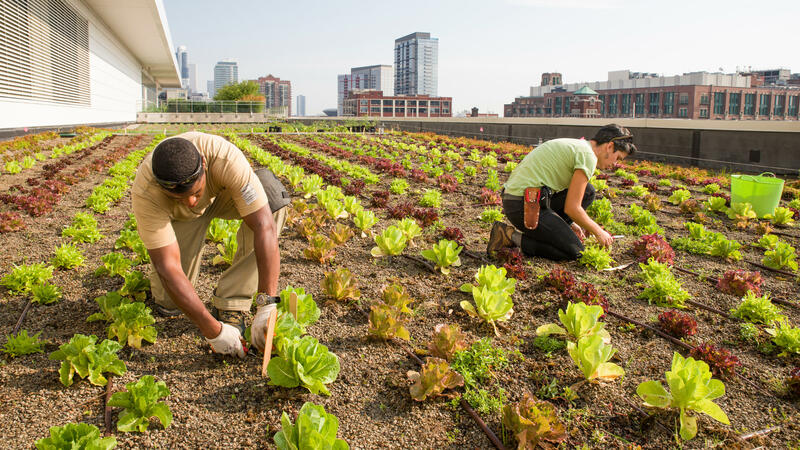 Late this summer, Chicago turned a green roof into its first major rooftop farm. At 20,000 square feet, it's the largest soil-based rooftop farm in the Midwest, according to the Chicago Botanic Garden, which maintains the farm through its Windy City Harvest program. "We took a space that was already a productive green roof, and we said, 'Why not take that one step further and grow vegetables on it?' " says Angie Mason, director of the Chicago Botanic Garden's urban agriculture programs. That required adding lots of soil amendment, or nutrients, to the rocky medium already up there. The farm sits atop McCormick Place, the largest convention center in North America, and the goal is for it to supply the center's food service company, SAVOR... Chicago, with between 8,000 to 12,000 pounds of food a year — more than 10,000 servings. It sounds like a lot, but SAVOR serves about 3 million people a year at McCormick Place. In the first season, Mason says the Windy City Harvest farmers, which include underemployed ex-offenders, will be growing kale, collards, carrots, radishes, peppers, beans, beets, cherry tomatoes and various herbs at the McCormick Place farm. The project's coordinators chose these crops because they're well-suited to a rooftop setting and they're fast-growing. Over the next few years, Mason says, the plan is to expand the farm to other sections of the McCormick Center roof for a total of 3 acres of cultivation. That would make it the biggest rooftop farm in the U.S., bigger than Brooklyn Grange, which operates a farm of 2.5 acres, or 108,000 square feet, on two roofs in New York City. 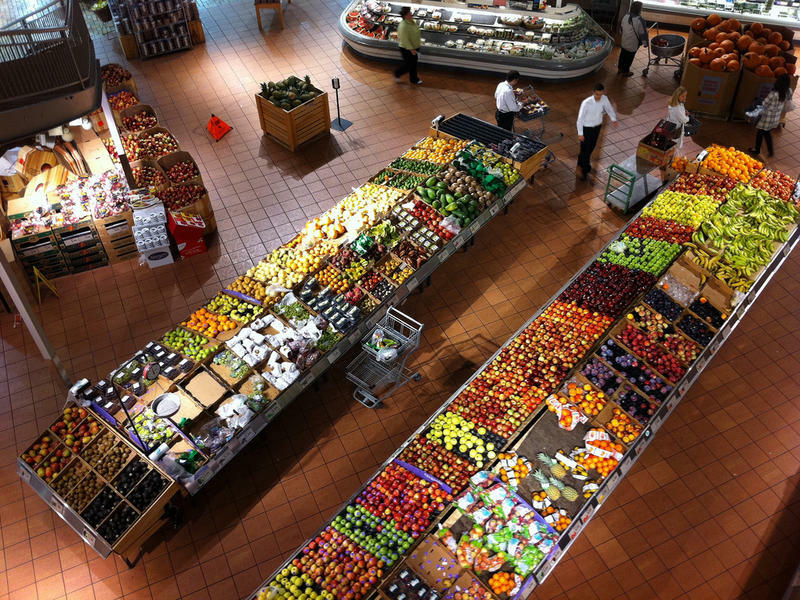 Joe Nasr, with the Centre for Studies in Food Security at Ryerson University in Toronto, says projects like these are part of a larger trend toward expanding food production in cities. "Rooftops will be part of the mix of urban spaces that will be increasingly used to 'scale up' urban agriculture," Nasr told The Salt in an email. 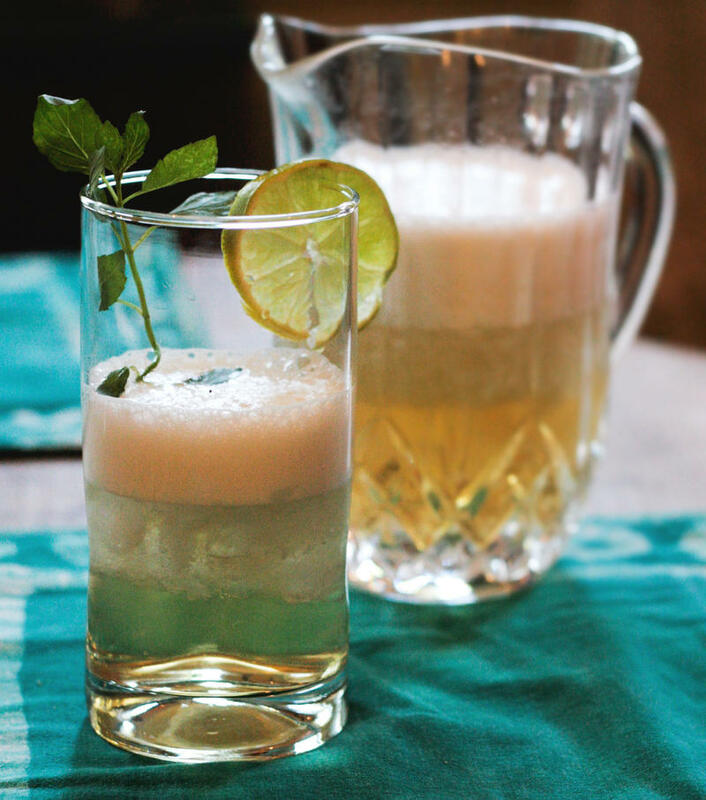 And roof farms in particular can offer a wide array of perks to the building owners. "When it is feasible to do so, you would be adding benefits to whatever the green roof [already] provides: food, space for community gathering and teaching in many cases, increased biodiversity (depending on the roof) and care for the roof — many green roofs fail because they are out of sight, out of mind, thus neglected," Nasr says. 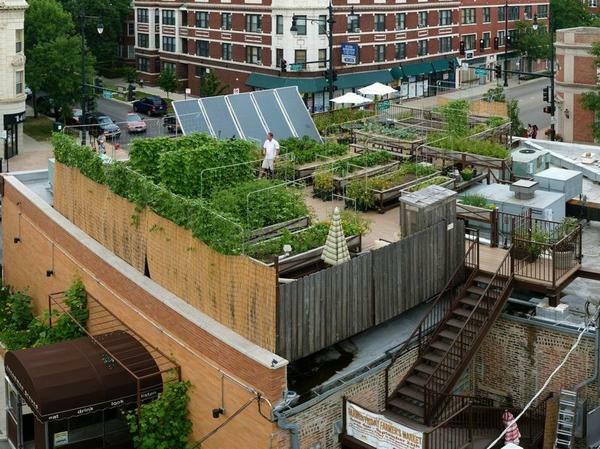 So why don't we see more of these rooftop urban farms? According to Mason, urban farmers are just beginning to figure out how to make them work. And they're learning that not every green roof is well-suited for farming. "You're looking at liability and insurance risk of having people on a rooftop, and then you've got to make sure it's structurally sound enough to withstand the extra soil weight for production," says Mason. "And you've got to make sure that you're training people so that they aren't compromising the rooftop membrane" and damaging it. Nasr agrees that there are many obstacles to transforming more green roofs into farms: from permitting, to delivering soil and water to the roof, to dealing with growing conditions that are typical of roofs (sun, wind, snow). But for urban farmers who can find a roof and building owners who will get on board, the potential benefits are worth pursuing, he says. And Mason says she sees plenty of opportunity in Chicago to convert more green roofs into farms — and plenty of building owners interested in burnishing their green credentials. Of course, you don't have to go as big as a farm to take advantage of the space and sunlight on a roof to grow food. People have been container-gardening on roofs for a long time, and as we reported, this form of micro-gardening is taking off. The juicy red tomato has been the target of an international trade war since the mid-1990s. It pits U.S. tomato growers, including DiMare Company of South Florida, against growers in Mexico.